Expore Shopping in Amsterdam. Practical Tourist Information. Shopping in Amsterdam is one of my favorite things to do. There is a great variety of shops, from regular mainstream brand names, huge department stores, small art and antiques shops, boutiques on the sides of the canals to lovely outdoor markets. Shopping hours in Amsterdam are mainly from Monday afternoon (1 to 6 p.m.) and Tuesday to Saturday from 9.00 a.m. to 6 p.m.
Thursday evening is shopping evening, the shops stay open until 9 p.m. and on Sunday you can shop at the Kalverstraat, Nieuwendijk and Leidsestraat. Giant grocery stores are open longer. Mostly until 10.00 p.m., but they are not always open on Sundays and on national holidays. Where to find the Best Shopping in Amsterdam? The closest to the central station is the Kalverstraat and Nieuwendijk. These streets are closed for traffic, so only shopping pedestrians line the streets and they do get very busy! These are the main shopping streets with large brand name shops for clothes, shoes, music and gifts. The shops are not exciting, but this is the practical shopping where the locals go. For bad weather days there are huge indoor shopping malls, like Magna Plaza at the Nieuwezijds Voorburgwal or the Kalvertoren at the Kalverstraat. Magna Plaza is housed in the city's former main post office behind Dam Square. It is a unique building of 5 floors filled with general shops. 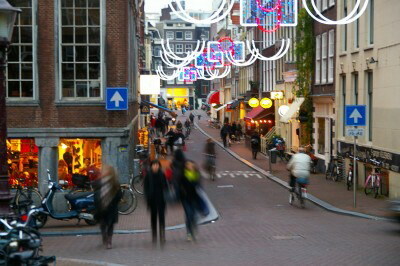 The most famous and interesting area to go strolling and visit the boutiques is called the area of the "nine streets". These small streets are located between Raadhuisstraat and Leidsegracht and they connect the Prinsengracht, Keizersgracht and Herengracht. (see the map on the right). In these streets you will find curiosities, antiques and specialties. A unique place in Amsterdam and lovely to stroll through the narrow streets and cross the old bridges over the canals. The nine streets will surprise you with their beauty and discoveries in the shops and boutiques. The next best shopping thing to do in Amsterdam are the outdoor street Markets. I consider these markets as something old-fashioned and typically Dutch. They are crowded, cozy and you will find fresh produce, flowers and more for very good prices. A lot of locals go to the markets for their shopping in Amsterdam. 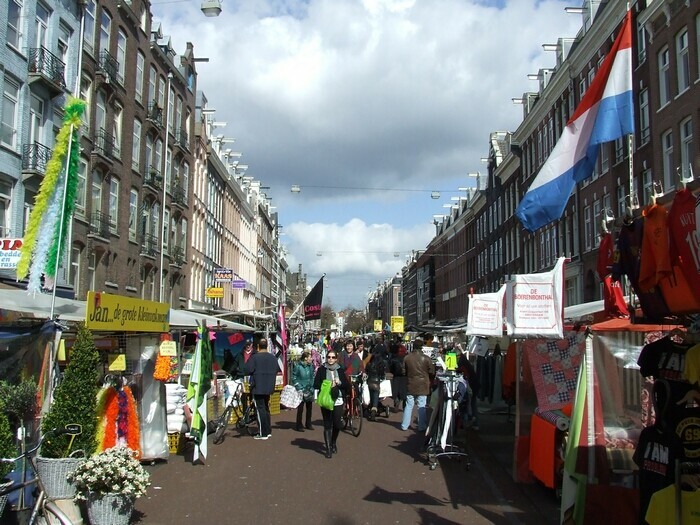 The Albert Cuypmarkt located at the Albert Cuypstraat is one of the largest and busiest markets of Europe. It's an interesting mix of traditional Dutch products like Gouda and raw Herring to quilts, fabrics and clothes. I love the lively atmosphere on this market and to watch the people coming here. This market runs from Monday to Saturday from 9.00 a.m. to 5.00 p.m. The Flower Market is famous because it is partially floating. Located at Singel, close to Muntplein. 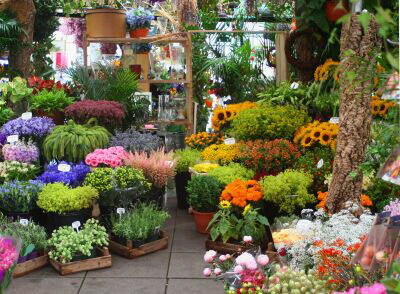 This colorful market displays the real Dutch speciality: Flowers. It is a beautiful sight and you can find the national Tulip, fresh cut flowers, seeds, bulbs and plants. The Farmers Market is very popular for its fresh and organic produce. Cheese, bread, fruit, fish, herbs and more can be found here. The farmers market runs on Saturdays from 9.00a.m. to 3.00 p.m and is located at the Noordermarkt. The interesting Art Market is located at the Spui plaza. Every Sunday in the spring/summer/fall, weather permitting. Local artists show their work at this large outdoor exhibit. Oil paintings, prints and photos are at display here. A finders paradise. Flea Market Waterlooplein. Who doesn't like a giant flea market? You'll never know what you're gonna get...Finders luck. More than 300 booths with CD's, DVD's, clothes, appliances and more curiosities... Located at Waterlooplein, everyday (except Sunday) from 10.00 a.m. to 5.00 p.m. Take tram 14 from the Central Station to get here. The map (right) is an interactive map of the places for your shopping in Amsterdam. You can hover over the pointers to see which shopping event is where. You can also use zoom and drag on the map.